Keeping data, which is stored on a variety of information systems, e.g. networks, desktop and laptop computers, personal digital assistants (PDAs), smartphones, tablets, or any other electronic media, private is essential for individual security, corporate security, and national security. While a majority of authentication mechanisms remain the same as they were more than a decade ago, attacks on information system infrastructures are becoming more sophisticated. Many, including financial institution, government agencies, and large organization, have always invested both time and money into improved security solutions. One emerging topic, namely sketch-based passwords, is the subject of this brief. 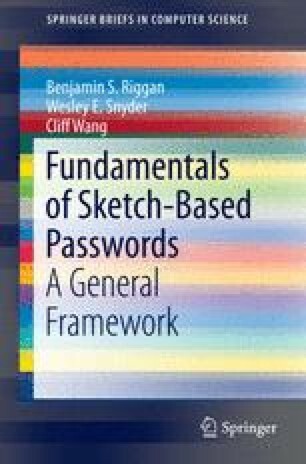 In this chapter, the need for alternative security solutions is greatly emphasized, and the fundamental concept of using sketch-based passwords (one possible solution) is introduced. Additionally, the major contributions and results presented in this brief are summarized.